Today Motorola announced the Motorola FlipOut during a press event in Basingstoke UK. The Motorola FlipOut will feature Android 2.1 with Motorola’s MotoBlur user interface. The MotoBlur interface syncs with your contacts, messages, and photos. And also aggregates your Facebook, Twitter, Myspace, Gmail & email accounts on the handset’s home screen. The Motorola FlipOut design looks almost exactly like the Nokia Twist for Verizon. 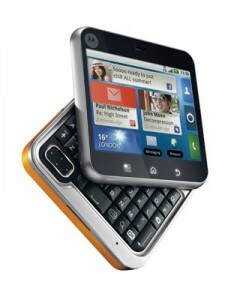 The handset has a square pivot design with a 5-row QWERTY keyboard, a 3.0 MP camera & Bluetooth. The FlipOut will have Adobe Flash enabled in its web browser, which will allow the user to view Flash enabled websites. The handset will also feature “Crystal Talk” which improves voice quality & filters out back round noises by adding a second microphone. The FlipOut will also feature an improved media player, which will have full screen lyric support, integrated song ID & will also allow you to know what others around you are listening to. The Motorola FlipOut will be available in Europe in the Q2 of 2010. I think this handset will be marketed mainly towards teenagers. Since the handset is mainly focused on social networking & not to mention the vast array of colors to choose from. So what do you think of the Motorola Flip Out?